The Truetone 1 Spot Pedalboard Power Supply handles all your needs under one plug! 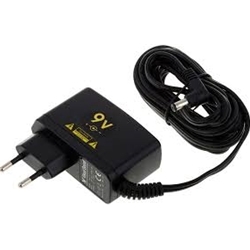 The 1 SPOT is the original 9V DC adapter that only takes up one spot on your power strip. With the ability to handle up to 1700mA, the 1 SPOT can power your entire pedal board with room to spare. Is the cable on your existing adapter too short? The cable is 10' long! Worried about compatibility with your pedals? Confused about polarity, plug size, voltage, etc.? The 1 SPOT makes it easy by providing a guaranteed list of adapters it can replace. They are: Boss PSA, Boss ACA, DOD PS-200R, Morley 9V, Danelectro DA-1, Dunlop ECB-03, Ibanez AC109, Zoom AD-0006. If your pedal takes one of these adapters (a 90% chance), you can use the 1 SPOT. New technology even allows you to use the 1 SPOT anywhere in the world without a voltage converter because it automatically converts voltage worldwide. Are you worried about AC hum coming through an adapter? Don't be. The 1 SPOT is one of the most quiet power sources you can buy. Only takes up one spot on your power strip! You only need a single 1 SPOT to power your entire pedal board!